Template:For the Laufey or Nál is a figure from Norse mythology and mother of Loki and consort of Fárbauti. 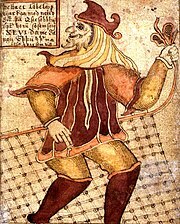 Eddic poetry refers to Loki by the matronym Loki Laufeyjarson (Old Norse 'Loki Laufey's son') rather than with a patronymic. Laufey is mentioned several times in the Prose Edda, composed in the 13th century by Snorri Sturluson. The first mention occurs in Gylfaginning, where High introduces Loki. High says that Loki is the son of Fárbauti, that "Laufey or Nál" is his mother, and that his brothers are Býleistr and Helblindi. Elsewhere in Gylfaginning, Loki is referred with employment of the matronymic Laufeyjarson (Old Norse 'Laufey's son'). This occurs twice more in Gylfaginning and once in Skádskaparmál. In addition, poetic means of referring to Loki are provided in the Prose Edda book Skaldskaparmal, including 'son of Fárbauti' or 'son of Laufey'. Nál is mentioned twice in the Prose Edda, both times appearing in the phrase "Laufey or Nál"; once in Gylfaginning and once in Skáldskaparmál. Nál means "needle"; according to Sörla þáttr, Laufey was also called this because she was "both slender and weak." The meaning of Laufey is less clear but is generally taken to be "full of leaves"; as Fárbauti means "dangerous hitter", there is a possible nature mythological interpretation with lightning hitting the leaves or needles of a tree to give rise to fire. ^ a b Rudolf Simek, Dictionary of Northern Mythology, tr. Angela Hall, Cambridge: Brewer, 1993, repr. 2000, ISBN 0-85991-513-1, pp. 186-87. Simek uses the spellings Nal and Farbauti. ^ John Lindow, Norse Mythology: A Guide to the Gods, Heroes, Rituals, and Beliefs, Santa Barbara, California: ABC-Clio, 2001, repr. Oxford University Press, 2002, ISBN 0-19-515382-0, p. 207. ^ Faulkes (1995:48, 50, & 96). ^ Faulkes (1995:26 & 76). ^ bæði mjó ok auðþreiflig, ed. Carl Christian Rafn, Fornaldar Sögur Norðrlanda Volume 1, Copenhagen, 1829, p. 392. ^ Jan de Vries, Altgermanische Religionsgeschichte volume 2, 2nd ed. Berlin: de Gruyter, 1957, repr. 1970, p. 263, note 1 (in German) indicates that Hugo Gering interpreted Laufey as "member of a distinguished clan" and Nál as "killer". ^ Simek, p. 78; but Simek, p. 227 doubts Nál is the same person as Laufey and considers relating the latter name to death, as in Naglfar.